For those familiar with the English Pre-Raphaelite painters, the phrase “modern Pre-Raphaelite” may sound as much an oxymoron as the Surrealist phrase “Soluble Fish”, in that the Pre-Raphaelites named their group after their desire to return to the “pre-Raphael” purity of the early Renaissance. John William Waterhouse was never a member of the Pre-Raphaelite Brotherhood, he wasn’t born until the year of their first exhibition, but he was very much influenced by them, took on many of the same literary themes in his paintings and is often associated with them from the perspective of a century and a half into the future. Unlike the Pre-Raphaelites, who made a point of breaking away from the Royal Academy and deriding it’s leadership, Waterhouse was completely comfortable with the Academy and was active as a member. For all of his classical training and Pre-Raphaelite leanings, Waterhouse was indeed modern in his time, particularly in his later work, when he moved away from his more tightly controlled early style, somewhat in the vein of Sir Lawrence Alma-Tadema and other romantic history painters, toward a more open and lively handling of paint. Influenced though he was by the Pre-Raphaelite painters in subject matter and emotional tone, Waterhouse differed in his approach to painting, specifically eschewing the detailed techniques that Millais at one point complained took a whole day painting an area “no larger than a five shilling piece”, and embracing instead the painterly, open brushstrokes of the French Impressionists and the English painters who had taken up their style. Not that Waterhouse painted in an Impressionist manner, but more of a lively synthesis of Academic and Impressionist inspired techniques, a sort of painterly and richly colored academic classicism. If Academic painting, plus Pre-Raphaelite literary romanticism plus Impressionist color and brushstrokes sounds like an improbable combination to you, the images above, and many others, will attest to its success. Waterhouse is not only a favorite of mine, but of millions. His images are among the most popular and frequently reproduced in the canon of Western art. J.W. Waterhouse: The Modern Pre-Raphaelite is an exhibition organized by the Groninger Museum, the Netherlands in cooperation with the Royal Academy of Arts and the Montreal Museum of Fine Art. It is the first major international exhibition of his work, and includes eighty painting and numerous drawings. J.W. Waterhouse: The Modern Pre-Raphaelite is at the Royal Academy of Arts from June 27 to September 13, 2009, and will be at the Montreal Museum of Fine Arts from October 1, 2009 to February 2, 2010. There are numerous books on Waterhouse, including a new one that accompanies this exhibition. I haven’t seen that one, but I can recommend J.W. Waterhouse by Peter Trippi. The latter volume, while perhaps not the most luxurious with illustrations, shows a curator’s keen eye in their selection and accompanies them with well thought out text that gives them a depth and artistic history many art books lack. I don’t know if the images I’ve chosen above have any relation to the exhibition, I’ve just picked them to be representative of Waterhouse, both in his most familiar and somewhat lesser known forms. 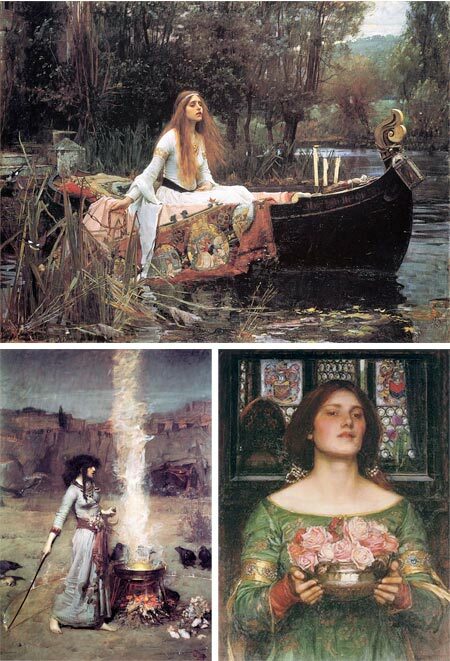 For more, see my previous posts about John William Waterhouse and The Pre-Raphaelites. Interesting and educational post and some nice work too, thanks for sharing.